Every day is a gift. Sometimes it’s what the cat brought in. I understand that this sentiment may cause some undue angst. After all, not every day goes spectacularly well. In light of this, I would like to remind you that simply because something is a gift, that does not necessarily imply that it is good. Ans an example, think about what cats have a tendency to give to people they love. From what I understand, it is often things like dead animals. With blood. And gunk. And other messy things. Most normal people would not find that to be an enjoyable thing. Some days are like that. They may be a gift, but they are not always seem excellent. And as a counter to that negativity, I would also like to remind you that even a dead mouse might be useful in the case of, for example, a zombie apocalypse. If you have a severe shortage of food, even a dead mouse might be useful. On that “cheerful” thought, I wish you a fair Saturday. This entry was posted in fluffy and tagged Fluffy on April 30, 2016 by Fluffy McGiggles. In addition to trailers-for-trailers being a “thing”, “Book Trailers” also exist. In fact, there are two of them for the upcoming “Trials of Apollo” series from Rick Riordan. I am not entirely sure what to make of this. This entry was posted in fluffy and tagged Fluffy on April 29, 2016 by Fluffy McGiggles. WHO thought “Mountain Chicken Frog” was a good name? Apparently, there is an endangered species in your world, where the last two known specimen are going to be introduced to each other to try to increase the number in existence. Although that is admirable, that is not what stood out to me about that article. I admit to some definite confusion in multiple regards. 1) Why are they called that? Alas, there is no explanation in the article. This leads to point 2) who thought that was a good name? How did somebody get away with naming an animal after a different type of animal, for no obvious reason? The closest I can think of is the Duck-billed platypus. There, however, the creature at least has an explanation written into its name. It is not a “duck platypus.” It is a duck-billed platypus. The Chicken Frog has no similarly obvious explanation. Thus, once more, I am left entirely confused by your world. This entry was posted in ANIMALS!, fluffy and tagged animals, Fluffy on April 28, 2016 by Fluffy McGiggles. I recently found out that not only is “Office Chair Racing” a thing in your world, but also it has expanded beyond its country of origin. This entry was posted in fluffy, real world, YouTube and tagged Fluffy, real world, youtube on April 27, 2016 by Fluffy McGiggles. I am pleased to inform you that there’s a new post up at the sister site cooking blog thingy. This one is on how to make (non-sweet) cinnamon coffee. This entry was posted in cooking, Webmaster and tagged cooking, webmaster on April 26, 2016 by Webmaster. So, some of my procrastination for the past few days has included some doodling. 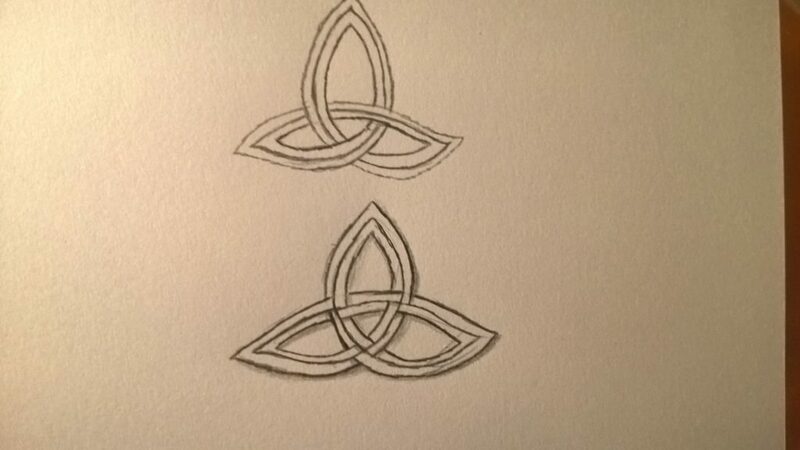 Especially doodling of Celtic Knots. So, yeah. There are a couple I doodled on this one. I’m especially fond of how the lower one turned out. Anyway, have a lovely Monday! I’m pleased with how these turned out! This entry was posted in drawings, Webmaster and tagged drawings, webmaster on April 25, 2016 by Webmaster. More Doctor Who Q and A with the Hillywood Sisters! So, there’s a followup video for yesterday’s post. It has the Hillywood Sisters doing a Q&A time. It’s shorter, but fun. This entry was posted in Webmaster and tagged webmaster on April 24, 2016 by Webmaster. Hillywood Sisters AND Doctor Who Commentary?!?! This entry was posted in Webmaster, YouTube and tagged webmaster, youtube on April 23, 2016 by Webmaster. Today’s is one that I have no (firsthand, personal) experience with. It’s a musical beach. As in, the waves play a custom made organ. I wager there aren’t too many beaches that sound like this elsewhere in the world. Hooray for the Sea Organ in Croatia! This entry was posted in Webmaster and tagged webmaster on April 22, 2016 by Webmaster. Today’s is another I like: Cliff-y, rock-y beaches. This one is a lot slower, more, well “grandiose” than the either two. At least from my perspective. This entry was posted in Webmaster and tagged webmaster on April 21, 2016 by Webmaster.